Panglao Island, Philippines, 30 June 2011. There is more to Panglao island than Balicasag - a famed dive destination in the Philippines that has earned honorable mention in most dive guides, even clinching top ten rankings in reviews. Balicasag Island diving has lured keen divers from around the world, like a neon lit bar would to insatiable drunks. The only neon lights that got me staggering was the heady flash of colours from the flirty Mandarins. It was nearly twilight when we dived, disrupting the sleety calm of steel blue surface water. Yolly and I were on a stakeout for those tiny dragonets that have a reputation for only stepping out when the lights are dim, and dressed to kill. Yolly, SeaQuest’s long-serving Filipino dive master, and I had planned on a ten-minute stop underwater to look for these coy beings, before moving on to observe the other critters at the Alona house reef, just a few hundred metres in front of the dive centre’s location on Alona Beach. 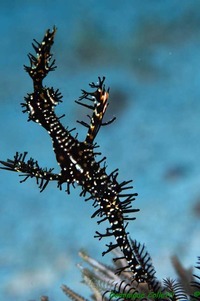 We saw one, then two Mandarins circling around the rubble of dead hard corals. Aha! There will be action, I thought. Instinctively we stayed put. Lo and behold, there was yet another dragonet, then the fourth emerged and then number five. Great, it will be a party I thought – bring out the San Miguel! But the dragonets took a long time to warm up, and it was only after 20 minutes when a Mandarin started to get fresh with another half its size. Still, there was no action. Yolly gestured if we should move on. I gestured back - over my dead body (you got to imagine this one). Six more minutes dragged by as we kneed on the sandy bottom observing these colourful fish circling, hiding, darting in and out of the broken corals, what I think is foreplay - boy do they take forever! And then at the 27th minute, out swam the lovers – one about 4 cm big and the other barely 2 cm - flitting up nearly half a meter midair in wild embrace, vibrating and doing their thing. The temperature around me must have upped a notch as these absolutely beautiful fish mated, not once but twice. What a treat! It’s getting hot in here, I thought, grinning from this delightful experience, and soon we left the scene of passion to explore others less X-rated. I felt jubilant – after such a long time, I had such leisure to observe marine creatures in their natural habitat, and that was because of the advantage of diving during the low season. And I had just arrived on Panglao island from an eco-tourism trip in Cebu and Bohol, ending with a dive trip and resort stay at Oasis Resort. Both Oasis Resort and SeaQuest Dive Center are owned by Dutchman BJ Schaap, a pioneering dive center proprietor in the Philippines. BJ first started his SeaQuest operations in Moalbaol on Cebu island in 1981, then Panglao island in the province of Bohol in 1990. 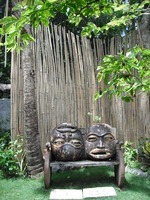 The third center recently set up is at Malapascua island. All three centers are 5 Star PADI Gold Palm facilities and located in the Visayas, central Philippines. This was the first week of June and the clouds were brooding. The wet season has officially arrived; in the Philippines the typhoons are said to be at their peak during the middle of the year. But at Panglao Island, mostly, it was hot to the point of melting sun block, reaching to 33 degrees Celsius. When it is hot, the water – clear and blue – is delicious for a swim and dive. You could peer from the surface down 30m to 50m on a clear day with great visibility. Snorkellers are treated to sights of corals and busy fish life even from the surface. There are around 16 dives sites around Panglao island, with 5 dive spots surrounding Balicasag Island alone. Other dive hotspots such as Apo Island located within the marine sanctuary can be reached within three hours by boat. “There are some some nice coral gardens, small walls, swim throughs and drop offs,” says SeaQuest dive center manager Marcus Benders. The Servera Shoal on the way to Pamilacan Island is known for its pit of banded sea snakes and other snake species. And divers can gaze at the lovely giant sea fans at length at Doljo Point. As I did not have the luxury of time, I only managed to squeeze in three days of diving that included coastal dives. Atlantis Wreck out south from Alona Beach had the best part of its sunken boat washed away leaving behind a wooden skeletal structure. This was a huge let down, but there was enough life to catch my eye, such as an ornate ghost pipefish, two boxer mantis shrimps, a yellow ribbon eel, wriggling juvenile sweetlips, thicklip trevallys and clouded moray eel. Not far away, Kalipayan provided a pleasant slope and wall dive with better coral cover and smattering fan corals. The resident frogfish eluded us but there were plenty others to entertain us at 17m depth: mantis shrimp, ghost pipefish, banded pipefish, four juvenile harlequin shrimp and sweetlips. And lots and lots of nudibranchs. At Balicasag Island, we fist dived at Cathedral and were blessed with corals garlanding the wall. Descending to a depth of 23m, and finning along the hallowed grounds with visibility of about 30m, we came across a yellow leaf fish and a creamy frogfish. As for nudis, there were plenty with a few species I had not seen before! So if you plan to dive here, bring along your camera with macro lens. The second dive at Diver’s Heaven turned out to rather hellish! A strong down current – totally unexpected – had us struggling to keep above 20m. This site is known for its rather swift currents going sideways, but this downward sweep was news to all indeed. For 20 minutes we were finning hard to get out of this pull, and when we finally did, catching our breath, we were rewarded with the companionship of two rather unperturbed green turtles and idling batfish. On the last day, I was thrilled to venture out to Balicasag Island again. Obviously I was cast under the spell of its underwater magic. Blackforest dive site did justice to its name as the steep slope unveiled rolling carpets of soft brown corals, branching corals and hard corals as well. We descended slowly to 29m – there was no rush. At about 25m visibility, I spotted an aggressive Titan triggerfish attacking my buddy’s fins, but soon to be jabbed away by the dive guide! Rico’s Wall offered a dramatic drop-off and sheaves of diverse corals. Imagine a lush coral garden you’d have in your dream house if you were Spongebob. At 25m depths, I relished the sights of a white angler fish perched on off-white leather coral, then two green leafy fish, barrel sponges and more. Lo and behold a green turtle drifted past that appeared tagged by a researcher. I wondered how much data this turtle has contributed thus far to help us understand its movements better. The final dive of the day at Rudy’s Rock was memorable. We descended the slope to 20m and hovered around the small sponge encrusted wall with eyes glued to schooling jacks way below probably at 50m depths. Then the backdrop of the deep blue ahead of me was filled with around 180 iridescent bluefin trevallys. As if this wasn’t enough, around 60 yellowtail barracudas charged onward with a purpose. Rapacious looking, these half-metre long barracudas were as harmless to divers as the humble sea slug. The Philippines is more of a ‘macro’ destination than anything else, Benders reckons. That includes nudibranch, blue-ringed octopus, mantis shrimp, flamboyant cuttlefish, pygmy seahorse, Indian walkman fish, frog fish, ghost pipefish, and harlequin shrimp. As for bigger action, whale sharks play a leading role, and ply the waters more frequently this year than last. 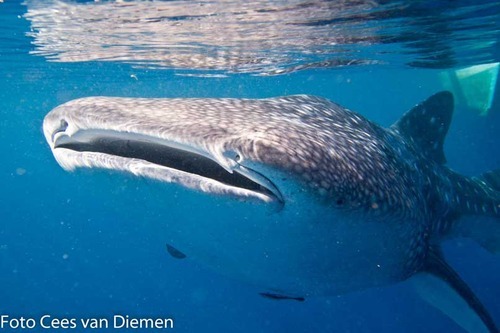 “On Christmas Day 2010, we saw five whale sharks in one day just on the house reef! That was special,” grins Benders. Benders thinks that the best time to try your luck in sighting these amazing creatures would be in “the cooler months of the year like October, November and December” although they have been sighted at other times of the year as well. “If we do see them, it’s usually for a couple of days. Our guess is that the whale sharks travel past here when they do their annual migration. So that would be going one way and then coming back the other way another time,” he says. Seaquest is involved in a project at Malapascua Island (its third base) to protect Monad Shoal, a famed reef for manta rays and thresher sharks. With the support of local authorities, ex-fishermen have been hired to patrol this dive site to warn off fishing boats. And it is working. “This project has some very good results; lately the sharks and mantas are larger in numbers and seen more frequently than before,” says Benders, who claims that Monad Shoal is the only place in the world that offers regular sightings of the graceful thresher shark. “We also follow the Environmental Users Fee that has been implemented by the local municipalities to conserve and preserve reef and fish life,” says Benders. The fees are collected at the dive center for the local government, which is advised by the local dive center associations on where to channel these funds, for example, in education. “Going into schools to get children aware and involved is one of the spear points of our organization here in Panglao. One of the visible results has been the beach clean-ups in cooperation with other dive centers, resorts, hotels and lots of school children,” explains Benders. Philippines is part of coral triangle in the Indo-Pacific region that is home to one-third of the world’s coral reefs. That’s around 75% of known coral species (about 600 species of corals), nearly 3,000 species of fish, half of the world’s seagrass and marine mollusk species, 75% of known mangrove species, six of the world’s seven species of marine turtles (green, hawksbill, olive ridley, leatherback,loggerhead, and flatback), and more than 22 species of marine mammals. There are nearly 1400 species of nudibranchs and sea slugs that have currently been identified in the Indo-Pacific region alone. With sustained conservation efforts all round, Philippines will remain a top dive destination in Asia. So head down south to Panglao island for some great diving and snorkeling after enjoying an eco-tourism stay in Cebu and Bohol (especially the Chocolate Hills – a marvel). You will not be disappointed even during the low season. Marine life photos courtesy of SeaQuest Dive Center. Others by Mallika Naguran. You can get to Panglao Island from Bohol, and to Bohol from Cebu, and to Cebu from Manila City. Most airlines fly direct to Cebu, but we recommend Cebu Pacific Airways that has wide domestic and international flight routes (including Singapore, Kuala Lumpur, Bangkok, Hong Kong & Osaka). There is no airport in Bohol yet. From Cebu to Bohol: Take a local ferry ride that takes 4 hours and costs about 650 pesos each way. The speedy catamaran service Supercat, however, gets you from Cebu to Tagbilaran town in Bohol province in little more than an hour, has frequent trips, comfy seats and even in-house movie (but pack a jacket as the ferry is freezing!). 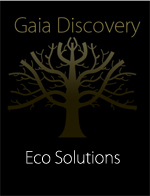 To be in good hands and to catch eco-tourism sights and sounds, hook up with reliable tour operators. We had Angel’s Wings Tours and Travels (AWT) take care of our itinerary, and we are pleased with its tourism services and knowledgeable tour guides. Several chalets and rooms along Alona Beach offer you a variety of choice. It is best to book up early especially during the high season. For comfort at reasonable prices, try Oasis Resort that has two restaurants, a bar, a pool and the SeaQuest dive center. Food is pretty good here. For higher end stay away from beach mongers, try eco-oriented Amarela Resort just up the road.